So, there was a 'crime against humanity' in Syria and the Idiot in the White house.... retaliated, kind of, well... maybe not as strongly as the initial reports might have led people to believe. Evidently the airfield is back in operation. I understand, if you want to watch, there's drone footage of the 'destruction' that's been provided by... the Russians. Yet there's no indication that any Russian aircraft were destroyed... or damaged, and yet I do believe the Russians use that base to fly missions against those rebels trying to remove Assad from power. 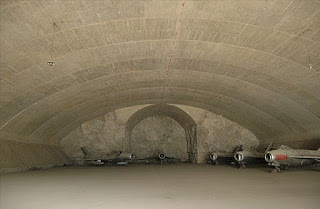 One of the problems Americans have is that when they're told that missiles hit airplane hangers, they picture large, cavernous spaces made of steel and aluminum. Not in Syria. The truth is that most of their planes are stored in places much more like bunkers, made of re-enforced concrete. This doesn't mean that they did take any damage, but nothing as serious as Americans most likely imagined. And then there's that little fact that the runways weren't targeted... Ooops. As time goes on more and more are beginning to understand that the Idiot in the White House has no problem with lying. He does it regularly. For him it's okay. This was more a 'wag the dog' type bit of propaganda than a retaliation. Unemployment figures also came out on Friday and they were anything but flattering and they needed something to keep the press from talking about that. This "attack". forewarned to Putin, is just another deflection.